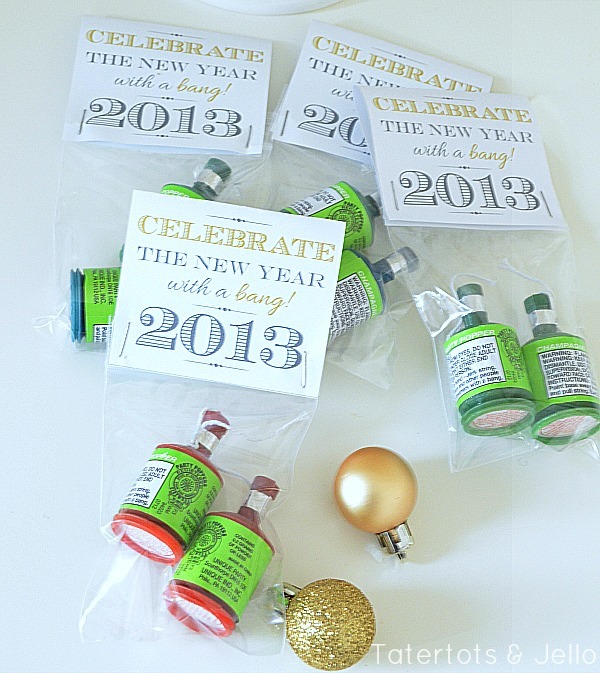 FREE New Year’s Eve Party Printables – Updated for 2014! 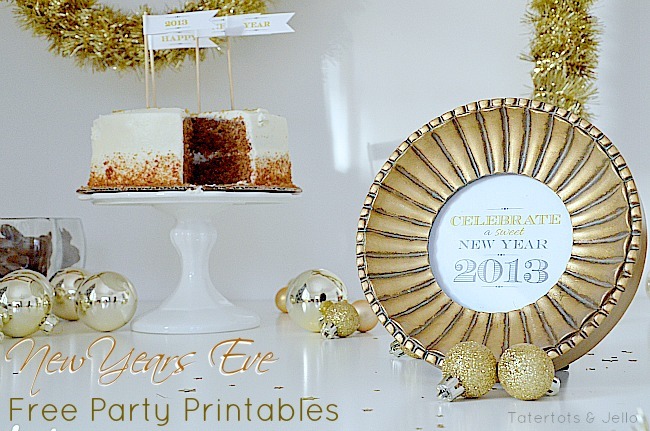 I liked the New Year’s Eve Party Printables I made for last year’s party so much that I decided to update them for 2014 and share them with you! I’ve updated last year’s post below — and you can find the printables at the end of the post! 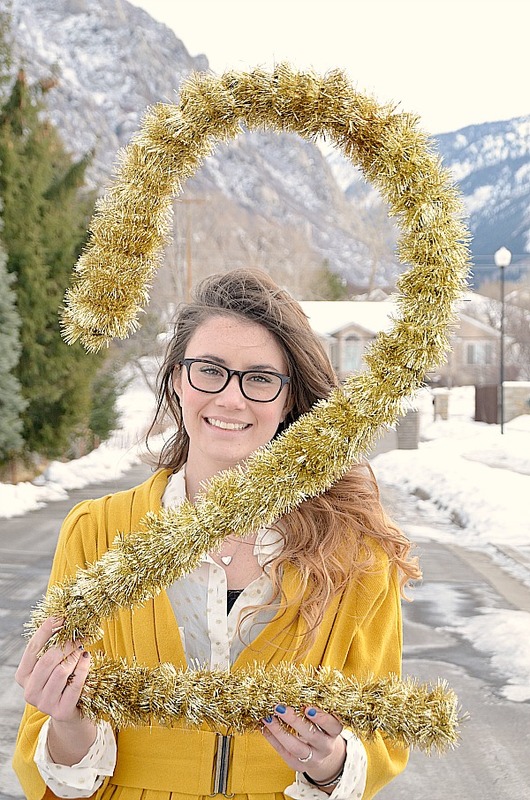 I had such a fun time making the New Year’s Eve Glittery Numbers, I decided to make some printables and use them for a festive New Years Eve Party!! 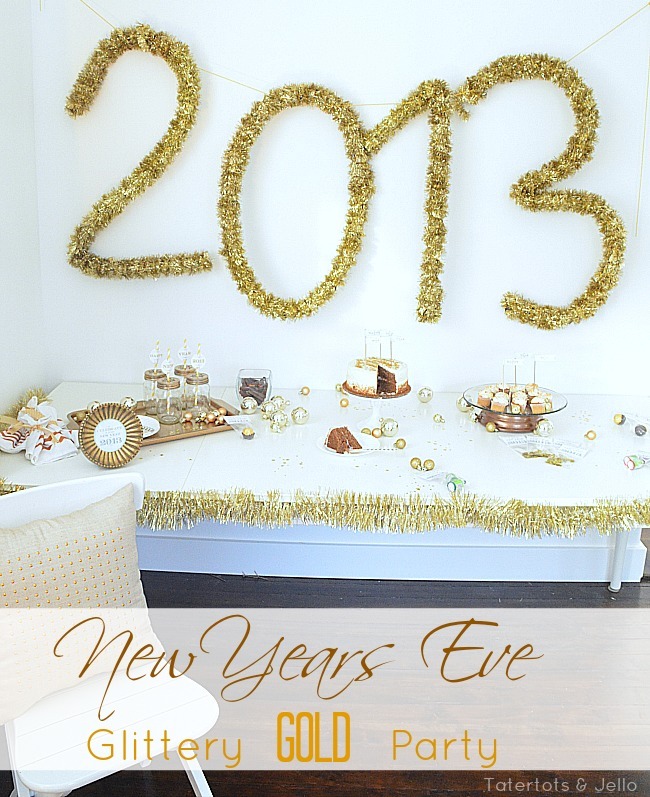 The glittery numbers were such fun to make that I wanted to build the whole New Year’s Eve party around gold! While the numbers were fun to hold, my daughters refused to hold them up for the whole party, so I had to think of a new idea. I hung the numbers on the wall using 3M Command Hooks and I used gold ball chain from Lowe’s to string the numbers across the wall from each hook. You may remember that the numbers have bendable wire in the center, so I simply bent the numbers to hang as flat as possible against the wall. It’s fun that the numbers have some depth to them — so I didn’t worry too much if they didn’t hang perfectly flat against the wall. If you wanted them to be more straight along the wall instead, you could simply hang each numbers using a Command Hook for each one. Next, I moved on to the serving table. To continue my gold theme, I took some gold spray paint and painted an old plastic tray, along with some mason jar drink tops. And I put a clear platter on top of a clock, and set it to almost midnight. I love that you can see the clock through the clear platter. 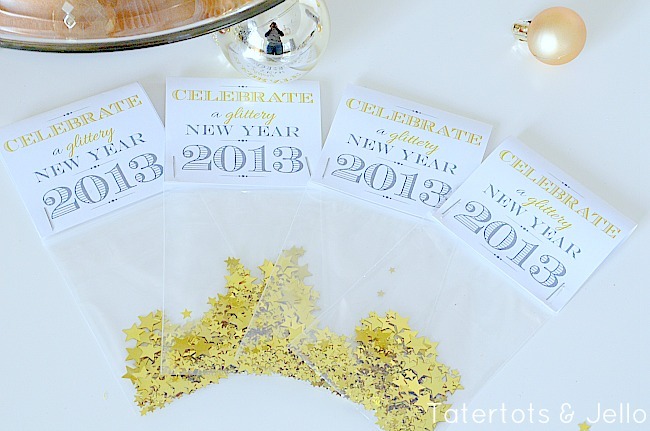 Then my nice husband helped me make some free printables for a festive GOLD New Years Party! We made Drink Holder Signs with slits to put the straws through. And also Banner Cupcake Toppers (I also used them as toppers on my cake). 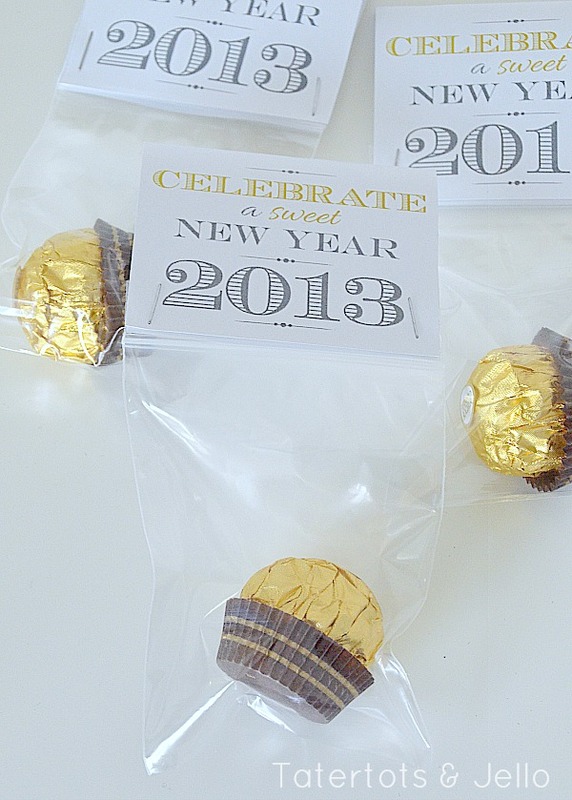 Then we created some little bag toppers for favors. I found the bags at Walmart in the craft section, they are 3 inches wide by 4 inches tall. And I framed one of the SWEET printables and put it in a little frame for the dessert table too. Feel free to use any of the printables for your own use. The layouts are made to print reasonably well on an inket or laserjet printer — or to be printed at your local FedEx office (Kinkos) or other print shop. 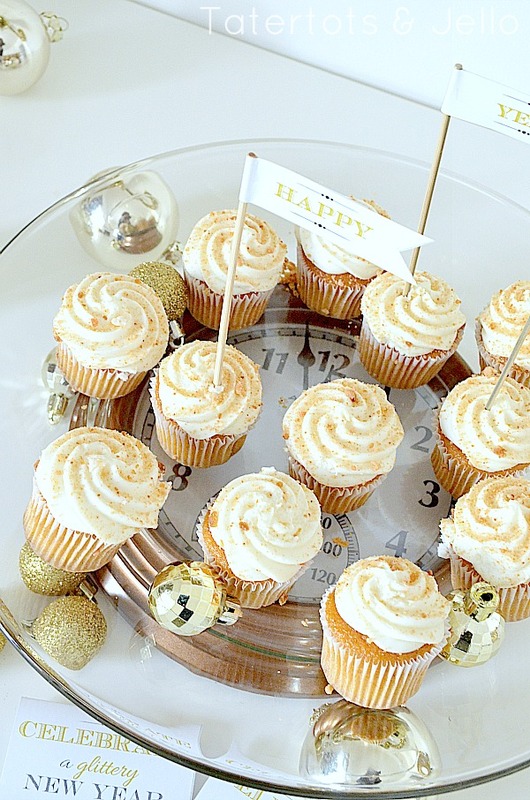 You can choose any or all of the variations of the party favor toppers! Here are the straw medallions. There’s a small gray line on the top and the bottom of each medallion through which to put the straw. I used an x-acto knife to cut quickly along each line. 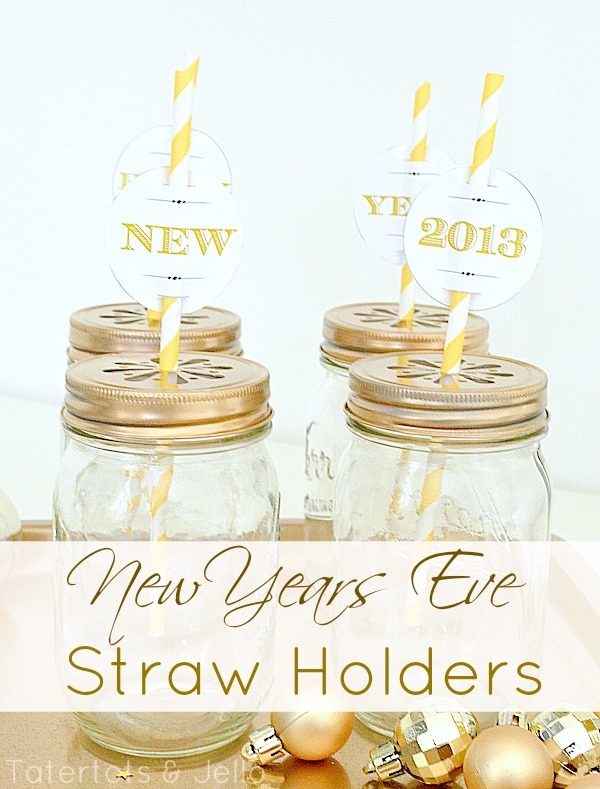 Remember to place the straw through the medallion so that the straw goes behind the middle of each medallion. Right-click this link or the image above and choose “Save as” to download the PDF. The “food flags” have a notched end only on one side to make it easier for you to cut out and tape — the back side is shorter so you can easily use a bit of scotch tape on the back to attach them to the toothpicks (or double-sticky tape if you’re feeling fancy). Here’s the second variation with the “sweet” phrase: Right-click this link or the image above and choose “Save as” to download the PDF. Best wishes for an awesome New Year! New Year’s Giveaway: Silhouette Cameo & Silhouette Portrait!!! Thanks Mique!!! Happy New Year my friend!! 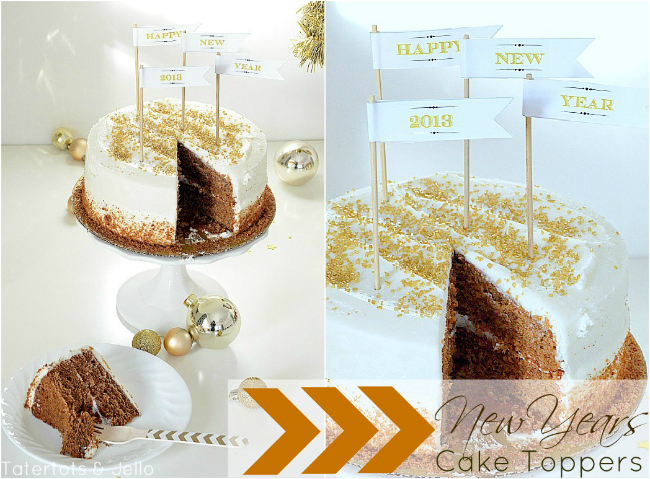 Jen recently posted…New Year’s Giveaway: Silhouette Cameo & Silhouette Portrait!!! Still loving those gold numbers Jen! And such fun printables. xoxo Happy New Year! !